About US Bathroom and Kitchen Remodel is ready to offer an all-inclusive design, service and installation experience for far less than what you’re likely to find from other vendors in Long Island or anywhere else. 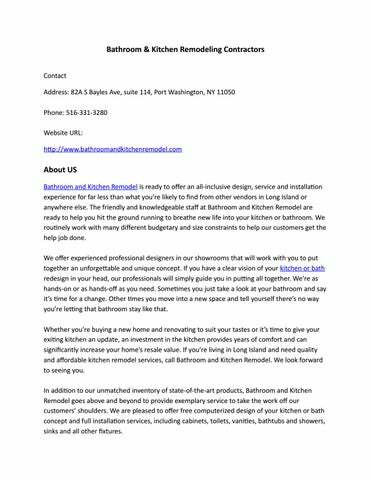 The friendly and knowledgeable staff at Bathroom and Kitchen Remodel are ready to help you hit the ground running to breathe new life into your kitchen or bathroom. We routinely work with many different budgetary and size constraints to help our customers get the help job done. We offer experienced professional designers in our showrooms that will work with you to put together an unforgettable and unique concept. If you have a clear vision of your kitchen or bath redesign in your head, our professionals will simply guide you in putting all together. We’re as hands-on or as hands-off as you need. Sometimes you just take a look at your bathroom and say it’s time for a change. Other times you move into a new space and tell yourself there’s no way you’re letting that bathroom stay like that. Whether you’re buying a new home and renovating to suit your tastes or it’s time to give your exiting kitchen an update, an investment in the kitchen provides years of comfort and can significantly increase your home’s resale value. If you’re living in Long Island and need quality and affordable kitchen remodel services, call Bathroom and Kitchen Remodel. We look forward to seeing you. 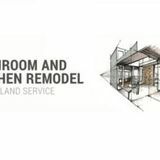 In addition to our unmatched inventory of state-of-the-art products, Bathroom and Kitchen Remodel goes above and beyond to provide exemplary service to take the work off our customers’ shoulders. We are pleased to offer free computerized design of your kitchen or bath concept and full installation services, including cabinets, toilets, vanities, bathtubs and showers, sinks and all other fixtures.